I sure love mixed practice. I have been treating a myriad of cases lately from birdies to doggies and kitty cats. I also received a phone call from one of my favourite clients giving me the heads up that her cows are due to start calving. She had a bad season last year requiring us to help her pull out a quite a few calves. Hopefully we don’t have to be as involved as we were last year because her bank account sure took a beating. Even though it has been awfully quiet on the bookings front, I just always find myself running behind and strapped up for time while I am at work. It just feels like my pace suddenly shifts into slow gear. I think it all really boils down to the fact that I use the extra time to do better case follow-up, research and even manage to collaborate with veterinary specialists on shared cases. This ‘extra time’ is never uninterrupted and so you can easily lose track of what you are doing. The most time-consuming aspect of my work these days is conducting behavioural consultations as they are fairly involved and they are fairly new to me. I have been offering this much sought after service for the past 6 months with the support of a veterinary behaviorist specialist. I am by no means a behavioural expert but I definitely intend to specialise in this area. First I have to read about a 20 page history followed by a 2-4 hour consultation. Then I have to type a 4-5 page behavioural report and discuss all the recommendations listed in the report in-depth with my clients. It does not end there; I also offer constant phone call support for 2 months following my consultations. Unfortunately, I struggle with these reports when I am faced with a behavioural issue that I have not dealt with before. While I have attended many conferences on veterinary behaviour, I still have so much to learn. So with those quirky cases, I find myself having to do so much extra research in the hope of getting to the heart of the behavioural issue. The biggest challenge I have been recently facing is typing up my behavioural consultation reports within reasonable time for my clients. I usually issue these reports within two weeks after our consultation. Currently, I am finding it is taking me an average of 3-4 weeks instead which is very frustrating for me. I hate keeping my clients waiting and want to offer them the best service possible. However, I simply will not take short cuts and offer poor advise to appear prompt and efficient. I just need to create a better and more structured approach to following up with my behavioural reports in a mixed practice setting. Speaking of which, I have two reports that are overdue! I will definitely be discussing why I have developed a niche for veterinary behavioural medicine in future blogs as it is a very dear topic to me. Anyhow, I better move onto updating you about what else has been happening at work. I was astounded to find out that I have gained the reputation of being the bird lady or bird specialist at my practice. I often have to explain to the clients that I am far from being a specialist in avian medicine and simply have an interest in developing my skills in this area. 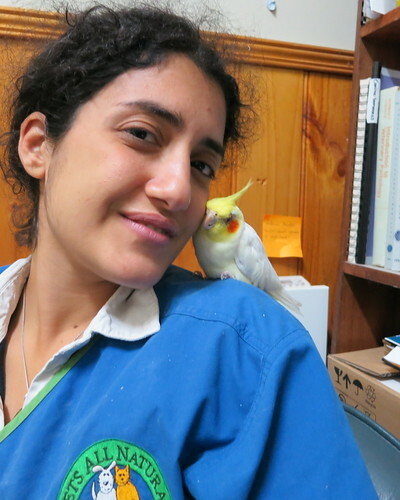 I am very lucky to have constant support from the vets working at Melbourne Bird Veterinary Clinic . Their phone advises or emails really boost up my confidence when dealing with feathery creatures. In the past two weeks, I often wondered why I seem to be compiling more parrot patients in my bookings. I love treating birds especially parrots. It can be a tad stressful when the bird I am examining costs $5000 or more. I guess another fun part about working in a mixed practice in a small country town is how quickly the word gets out. If the clients figure out you are particularly good at dealing with a certain species, you suddenly are promoted to earning the title ‘specialist in that area’ without having to do any memberships or further study! You merely have to show an interest in poultry or horses or even donkeys and you are then consequently highly regarded in that special area which can be both flattering and daunting. Check out this stunning two-year old ‘Indian Ring Necked parrot’ that I had to workup for lameness. I will be discussing her very interesting case in a couple of weeks when I get her final progress report. This is a picture of her recovering from her anaesthetic. 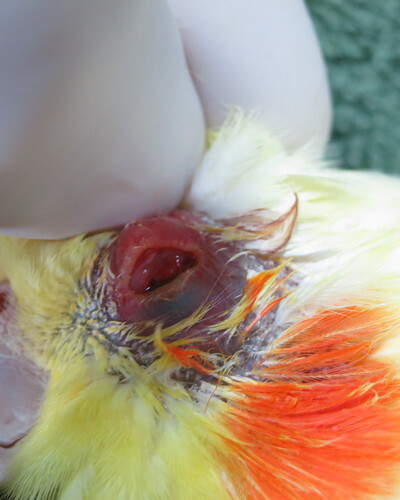 My favourite avian patient so far is ‘Yellow bird’, the hand raised cockatiel that I examined one week ago. He was so forgiving and made a truce with me even after I probed him which is very unparroty of him. The poor little guy presented to me with a very sore eye. He had been scratching the affected eye and squinting constantly. He was very feisty during the examination so I decided it is best to put him under anaesthetic to better assess his eye. Yawza that really looks so painful and you can see why an anaesthetic was the kindest way to examine him. I determined he had severe conjunctivitis and a corneal ulcer. I thoroughly flushed his eye with saline and started him on antibiotic eye drops. He recovered well from his anaesthetic & spent some time sitting on my shoulder after his procedure. ‘Yellow bird’ & I even got to snuggle. Now besides parading as a ‘bird wanna be specialist’, I have also been performing many dentals on my feline and canine patients. ‘Tabatha’, an 18-year-old female desexed tabby cat, had her dental two weeks ago. She recovered well but her owner noticed that her dementia signs (meowing aimlessly in the middle of the night) deteriorated the week after her procedure. Thankfully she is now back to her merry old self and her owner has caught up on much needed sleep. As for ‘Badger’, my 12-year-old male desexed dachshund cross patient, I had been trying to convince his owners to book him in for a dental for the past 6 months. 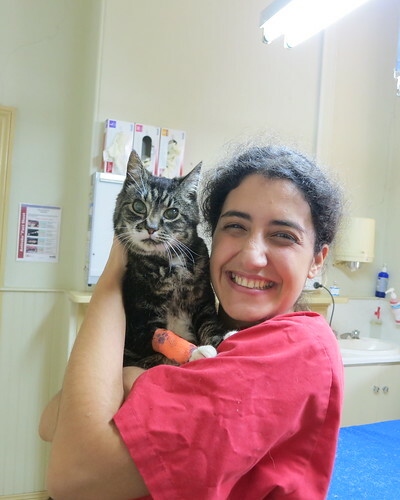 They had been very hesitant and rightfully so because he was already suffering from severe heart disease and the risks of putting him under anaesthetic were pretty high. However, I kept voicing my concerns that his quality of life was being compromised as his teeth were rotting in his mouth and further exacerbating his heart condition. I finally went was given the green light to go ahead with ‘Badger’s dental and he made an excellent recovery. It’s a pity I don’t have a picture of ‘Badger’ because he is so terrified of the vet clinic. I will try to capture a nice photo of him in the coming few weeks :-). His owner asked me if I had given him a blood transfusion a couple of days after his procedure. I was flustered with the unexpected question and asked her why she had thought that. The owner replied saying she was just amazed by how much more lively he has been after the procedure and wondered if he had been invigorated with blood. Personally, there is nothing more fulfilling than discovering my efforts to alleviate my patient’s pain and improve his quality of life has paid off. The last case I would like to talk to you about is ‘Puppy’, the 6 week old Schnauzer male puppy, that presented to us with bloat. This cheeky little puppy had stuffed himself with soaked puppy dry food. He arrived looking pretty pitiful. He was weak, kept collapsing on his back legs and was in a world of pain. We started him on pain relief and iv fluids and admitted him to hospital for close monitoring. This is poor ‘Puppy’ looking so miserable & sad. I was the vet on afterhours duty and I last checked ‘Puppy’ at around 11 p.m and was not happy with his progress. He still looked very flat so I decided to drag him home. Throughout the night, Mr. Puppy belted out sopranos demanding attention every 1.5-2 hours. He was hungry but I had to fast him to allow him to digest all the food he had binged on. Initially I was very worried he was vocalizing because he was still very painful. As he was only 6 weeks old and used to being with mom and his siblings, I soon discovered he was crying out just for attention. Needless to say, I did not get much sleep. Check out the video of him squealing for attention after I put him back in his cage before I took him back to work. Imagine trying to sleep through that! 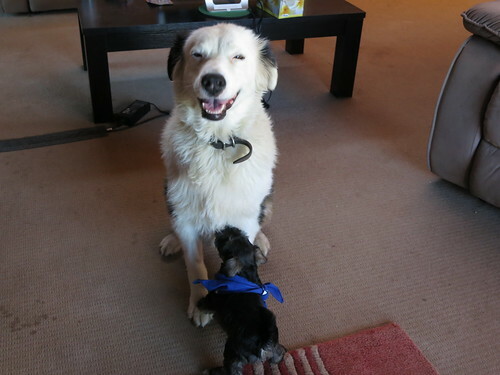 In the morning, the little critter had passed lots of stools and was happy to embrace his puppihood again. It was so much fun watching him chasing after my dogs. ‘Shepo’, my 8-year-old Aussie Shepherd, was happy to interact with him as opposed to my snobby ‘Punchkin’, my 6-year-old mutt, that felt quite threatened by the whole ‘puppy on the loose’ situation. This is ‘Shepo’ preying that ‘Puppy’ will soon get bored with tugging on his fur. Enjoy the videos below of ‘Puppy’ chasing my dogs around the house. So funny! And the last video is of the puppy finally deciding to sleep in…Enjoy! ← Eye injuries in pets are true emergencies!!! I’m glad you’re there for them all! 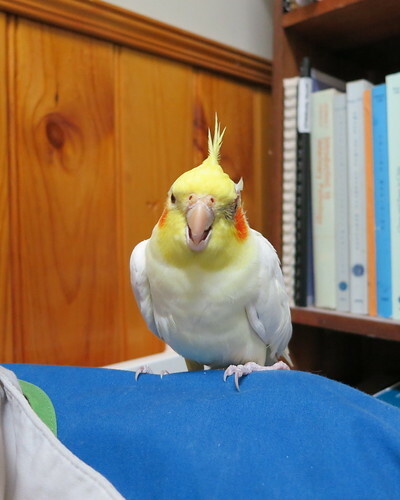 What an adorable bird, and it seems “Yellow Bird” was thanking you, snuggling up while sitting on your shoulder, just beautiful. I love this post. And good for you for building skills in the areas you’re choosing. Behavioral consults are so important! Sweet to hear all your healing stories. I really enjoyed watching the videos of the little schnauzer puppy “pestering” Shepo, who was exceptionally patient with him! You are one vet in a million Rayya! 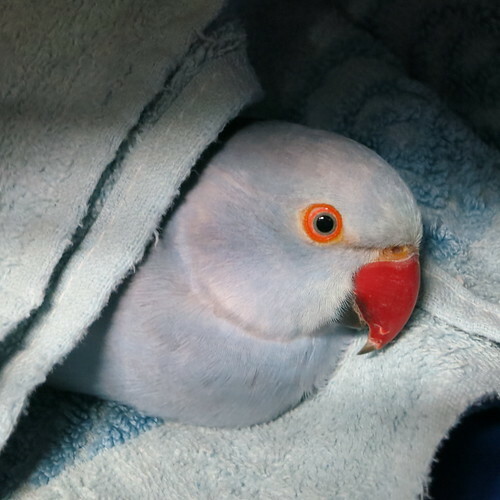 All such lovely patients – Tabatha is gorgeous, as is the cockatiel. Amazing stories, and a credit to you. Hey Dr. Rayya, we’ve been getting that alot about our comments and that stuff called spam… we think it’s because we are a wordpress blog! We have lots of trouble being accepted by blogspot. 😦 Thanks for saving us from the dumpster. We really do like your site and love learning about your experiences. Have a great day. I see you have to struggle with different species and at the same time, you try to give the best solution but many times this means investing a lot. My advice would be that you should look for the best diagnosis and treatment, but no one can become a specialist in many fields. It is not realistic. Choose the field/s that motivate you most and developp them. The other areas must be taken on charge by other persons that work with you (or not). I think honestly that you are assuming a too big responsibility in the sense that no one can solve everything in different species. Personally, I love dogs and cats but I am afraid of horses, I am ignorant about exotic species, I just see them when travelling to see them (whales, dolphins, bears, …) but I would never try to become their doctor. For example, when you talk about your interest in behaviour, I recommend you collaborating with specialists (if they are willing) and simultaneously use protocols that allow solving the majority of cases. I use a book from two UK behavioural specialists that helps a lot without having to invest so much time on a single case. I´ll let you know the title, I am not at the practice right now. You could also use Vin.com, I think this kind of networking is very helpful and more updated than regular bibliography. I am used to help students and you are young too, so I think you can benefit from my advice. Keep on going, good Luck and LIMIT responsibility. Of course, learning always is a great motivation. A practical way to expand your knowledge and get worldwide recognition is applying for American Board of Veterinary Practitioners. They provide a species-oriented diploma, and you could prepare for it working as a member of a Group. Have a look at ABVP site! These pics are AWESOME – The Red Man needs a behavioral consult!! Thanks for following him, too!! 🙂 I bet he would love all the doggie & kittie smells. For sure! Have a great weekend! I was really surprised that the little puppy had bloat, I had no idea they could bloat that young. I was also surprised that he didn’t require surgery, in the states the only way they treat bloat is through surgery. Hello, I come from across the world, my friend Laurie Bartolo recommended to visit your blog. The truth is that you have a wonderful blog, didactic, accurate, dynamic. It’s a luxury to have come this far. Sorry for my English, I’m from Argentina. A huge salute to you. Thank you, for stopping by our blog. Wow!!! I wish you lived near us what a wonderful, caring person and vet you are. The videos were just adorable and made me giggle. What a good dog you have to be so sweet and gentle with the puppy. Bless you for what you do to help all the animals and people. Hugs and nose kisses from me and my crew! Sonel I am so flattered with your llovely comments. Thank you. Great blog. I have a phobia of dogs, but I’m now finally wanting to get a dog and overcome my fear. 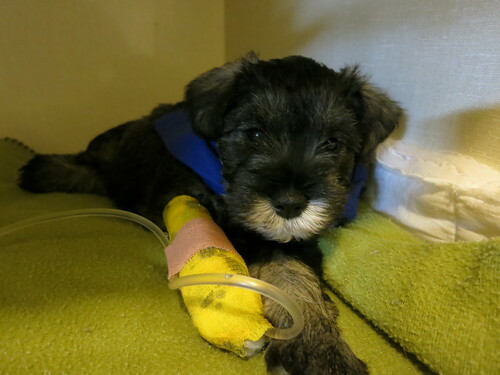 How could that helpless little puppy with a cast be resisted!? I would agree with the comment before the best vets are specialist in the field they choose. Just like people go to specialist for the body, eyes, lung, bones, dentist the same is true for our beloved 4 legged friends. Hey Melody. It is always so great to hear from you. Your amazing comment really lifts my spirit. I so enjoy reading your,blog because your love fir animals is so evident. :-). Raya ! its really interesting to read your stories and seeing wonderful pictures.. I have a boxer puppy and his eyes seems wet all the time like tears or something. Nothing seems wrong in his eyes but only I was wondering if that is his tears or it usually be like that or I should visit the vet ?? Thanks !! Glad you are enjoying my blog :-). As for your lovely boxer, you should definitely get him checked out by your local vet. Boxers are predisposed to range of eye conditions, mostly getting recurrent eye ulcers. I would be more concerned he may have entropian or extra/abnormal eye lash position or it may be as simple as hay fever like allergies causing his eyes to water. Whatever it is, best to get him checked out by your vet soon. Best of luck!